Lilies have a long, rich and symbolic history, their importance has dated back to 1580 BC when they were drawn on walls of Egyptian tombs. Lilies have been a popular flower in Jewish culture and they are popular in Greek culture as they symbolise purity. In Chinese culture they symbolise undying love. 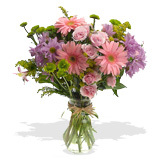 Pastel lilies make are a delicate and soft arrangement and produce a divine scent. A pastel lily bouquet makes a lovely gift to celebrate a newborn and they also make a lovely friendship bouquet. Arranging Pastel Lilies: Cultivated for over 3000 years, Lilies are one of the oldest flowers in history, mentioned in both the old and new testament. The symbol of chastity and virtue in Christianity, these versatile blooms are symbolic of summer and abundance in Feng shui, and symbolize “forever in love” to the Chinese. You pastel colored lilies will arrive in bud form, opening in succession over the next 1-3 days. Please note that pastel and light colored lilies bruise easily and need to be handled with extra care. As not to damage the petals. It is also important to remove the anthers before arranging your lilies to avoid staining of clothes and furniture. Pastel Lilies Bouquet Care Tips: Your pastel lilies bouquet has an estimated vase life of 7-10 days, if properly take care of your lilies can last longer. Your pastel lily bouquet will arrive in bud form, and will open in succession over the next 1-3 days. Cut the bottom of the stems 1 inch diagonally under running water and remove all the leaves that fall below the water line. Place your lilies in the vase with lukewarm water mixed with the first packet of floral food. Your lilies are thirsty flowers, so make sure you check the water level daily and replace with fresh water and more flower food if necessary.